Day 3 of Bennett University’s Sports Day, Four Flags, saw students compete for the final leg of the three-day event. The Triathlon witnessed the toughest competition with eight boys and three girls participating from the four University houses. The day ended with the felicitation ceremony followed by a DJ night. It began with treasure hunt final for which five teams had qualified. Team BKL, captained by Vedant Sahu, took the treasure home. The day continued with the finals of track events, the finalists of all four University houses ran towards victory in 100m, 200m, 400m and 4x100 relay races. Along with athletics, to keep the sporting spirits and sense of competition alive, the sports department conducted fun games which included tug of war, sack race, lemon spoon relay race and three-legged race. 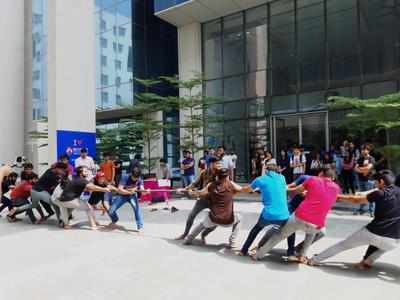 Tug of war took place between students from different years in the University. The afternoon of the third day saw the most exciting and awaited event, the Triathlon. It included cycling for 630m, running for 200m and swimming for 60m. The girls of Heroic Hearts Aradhita Mishra and Avishka Sharma won hearts of all by bagging the first and second position respectively in the Triathlon, female category. Abhishek Sharma of Super Spades and Ritik Agarwal of Heroic Hearts came first and second respectively in the Triathlon, male category. To conclude the afternoon, a felicitation ceremony was held. All winners of internal and external tournaments were awarded for their excellence. Arsh Katiyal was given sportsman of year award for his exemplary performance in field of sports, discipline and all-round development while Nandini Bishnoi was awarded Outstanding Performance in Sports, Girls. The Chief guests for the felicitation ceremony was Divya Singh, former captain of Indian National Basketball Women’s Team and is now a coach. Vice Chancellor of Bennett University, Raghunath Shevgaonkar was also present. Pratima Singh, the senior sports officer, closed the ceremony with a “Jai Hind”. The felicitation ceremony wasn’t the end of Four Flags. A DJ night was organised for the students to de-stress them from three days competitiveness. “Our first sports meet was very successful and are hoping for more participation next year. We have a number of talented athletes and will now help them improve their skills,” said Chandu Appasani, Sports Secretary.